We just uploaded a new article to the Stromberg Tech Center. 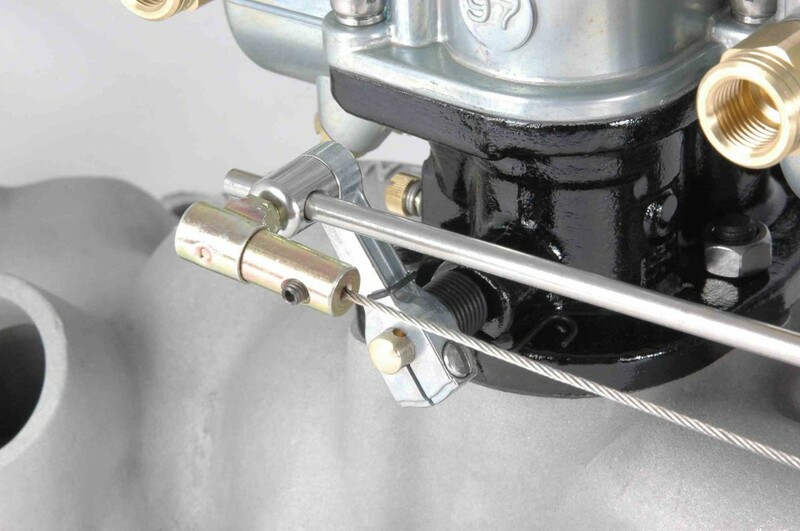 ‘How do I connect a throttle cable to a Stromberg TwoStep Linkage?’ Cable throttle systems using our 9136K bracket kit make Stromberg 97 carburetor set-ups even easier to use. And this article explains how it all happens. 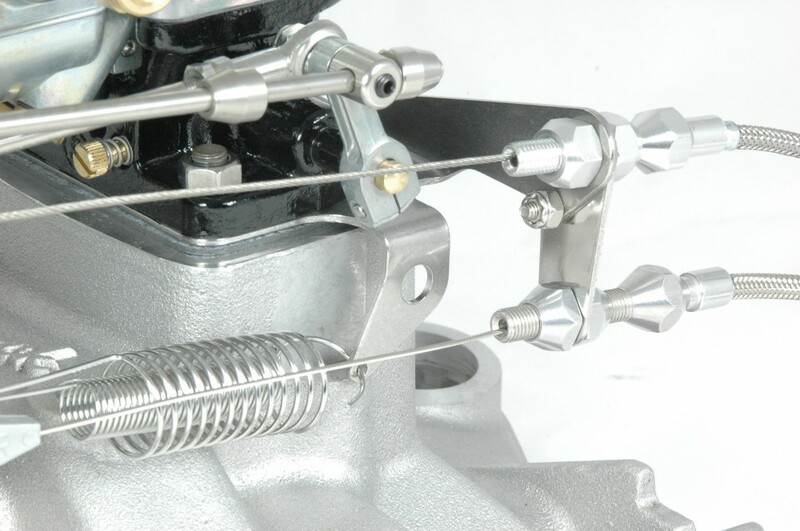 To read it in full, click this link – Stromberg Tech Center, How do I connect a throttle cable kit to a Stromberg TwoStep linkage? Our 9136K Cable Throttle Bracket is compatible with pretty much all Stromberg 97-based intake manifolds, though some Ford Flathead intakes need a remote fuel pump to work with cable throttle. It’s easy to install, of course, especially if you download our ‘How To: Install 9136K Cable Throttle Bracket’ instructions from the Stromberg Tech Center. Just remember to stick it under the rear carburetor on your intake. And note that on a 3×2 direct linkage, the bracket lifts the rear carburetor a little, so the front two carbs may need packing with extra gaskets (see our kit 69447K) for perfect linkage alignment. On a 2×2 direct or 3×2 progressive linkage, this is not a problem. Aftermarket throttle cable kits should come with a fitting on the carburetor end of the cable which clips into a small threaded ball. To attach that ball to your Stromberg linkage, simply remove it from the cable end fitting. Remove the small black set-screw from one of the Stromberg linkage swivels. Screw the threaded ball into the swivel (clamping the linkage rod as with the set screw) and clip your throttle cable end back onto it. If you have a 2×2 linkage, fix the cable to the front carburetor. On a 3×2 system, fix it to the center carb, either into the swivel or (on the longer progressive lever) through the lower adjustment hole. Always check that the threaded ball clamps the linkage rod tight. WARNING! Always double check that you have connected all of the linkages – throttle, choke, accelerator pump – and fuel lines correctly. Manually (and from inside the car), operate the throttle lever and choke mechanism to ensure free movement. Any sticking, binding, or ‘over-center’ movement in the linkage could result in uncontrolled engine speed, property damage, serious personal injury, or death. Always use a throttle return spring. New Stromberg bracket for cable throttle – and kickdown! Here’s a piece we should have launched years ago. Say hi to our new cable throttle bracket (Part No: 9136K), making your Stromberg 97 3×2 tripower set-up even easier to use, particularly on small block Chevy and Ford engines. 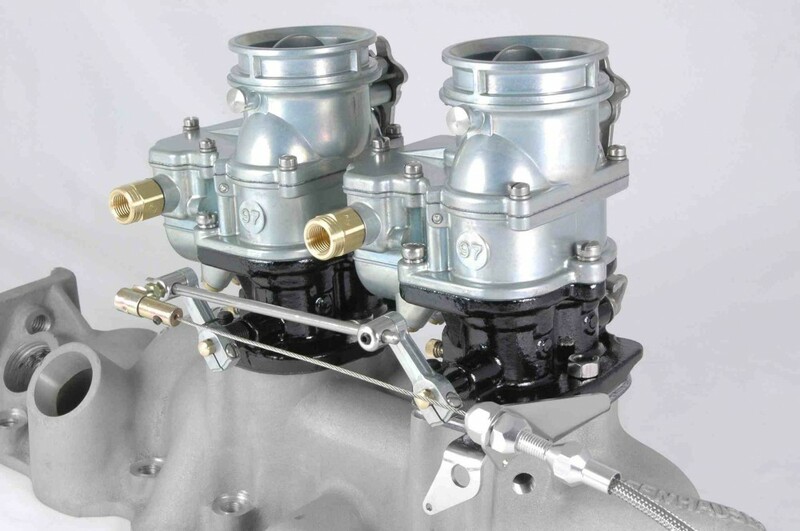 You mount it securely between the carburetor and intake manifold (it comes with an extra gasket), and it positions the cable for optimum, bind-free ‘pull’ on the Stromberg premium progressive linkage. There’s a fixing hole for the small extension bracket supplied with most hot rod auto-trans kickdown cable kits. And a separate side arm provides a mount for a traditional return spring – or you can chop it off if you use our Stromberg 9154K torsion return springs. We have a lot of customers nowadays converting their small block Chevy/Ford from a 4-barrel carb, and many already have Lokar-type throttle and kickdown cables in place. Our new cable bracket, coupled with our new ‘kick-down compatible’ progressive linkages, help make that swap as easy as possible. You can keep all your cables, and even your 4-barrel Lokar® return springs. While it was principally designed to work with small block Chevy and Ford motors, our new stainless steel bracket is also compatible with most Ford Flathead tripower intake manifolds, (though not with the stock fuel pump). We’re sure you can find a heap of other ways to use it, too. As ever, help with installation is available from the Stromberg Tech Center. New Stromberg 97 bracket for cable throttle – and kickdown! And today’s super-hot Stromberg product of the month is…our handsome new Cable Throttle Bracket (Part No: 9136K), making the Stromberg 97 3×2 tripower set-up even easier to use, particularly on small block Chevy and Ford engines. Easy to use? Of course…Mounted securely between the carburetor and the intake manifold – with a gasket each side, of course – the new bracket positions the throttle cable for optimum, bind-free ‘pull’ on the Stromberg premium progressive linkage. There’s an extra fixing hole in the arm for the small extension bracket supplied with most hot rod auto-trans kickdown cable kits. And we’ve added a separate racy-looking side arm so you can mount a traditional return spring. Ok, so we tend to prefer our own torsion type return springs, but it gives you the choice. If you don’t need it, trim it off! Truth is, we have a lot of customers converting to 97s from a single 4-barrel, so many folks already have Lokar® type throttle and kickdown cables in place. Our new cable throttle bracket, coupled with our new ‘kickdown compatible’ progressive linkages, help make that swap as easy as possible. You can keep all your cables, and even your 4-bbl return springs. 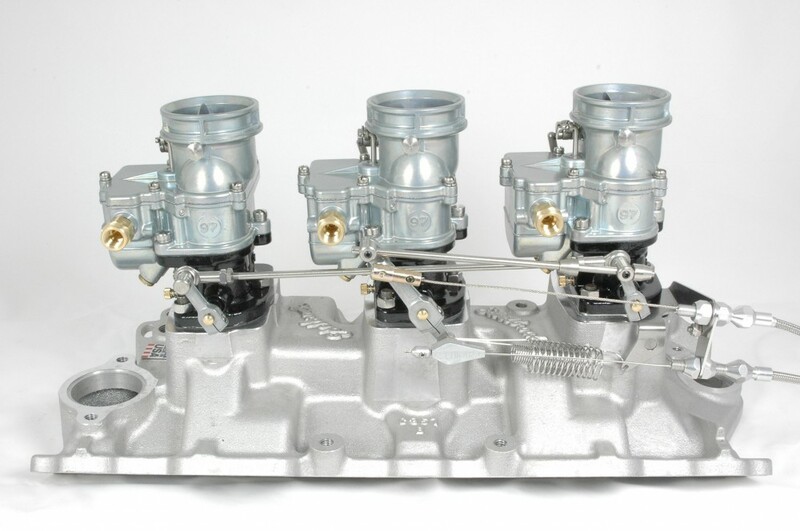 The kit includes a new carburetor gasket, and help with installation is available from the Stromberg Tech Center at www.stromberg-97.com. Prices? We’re looking at $39.95 and/or £21.62 plus UK taxes depending on where you live. While it was principally designed to work with small block Chevy and Ford applications, the new stainless steel bracket is also compatible with most Ford Flathead intake manifolds. We’re working though our considerable stock of ‘currently available’ flathead intakes to see what works with what, and it already looks like the bracket won’t work with the stock fuel pump, though you may be able to trim it down in some circumstances. We’re also looking at how we can adapt 2×2 linkages to cable operation, probably with a new bracket we have in mind for the other side of the carb. We’ll report back as soon as we have more news, and post it on the Stromberg Tech Center too.